QR codes used to simplify process for outgoing travellers. Brisbane Airport has begun trialling a digital departure card for international passengers to replace the existing paper-based process. Under Australian law, departing international travellers are required to fill out an outgoing passenger card with details of their identification and record of departure. The digital departure card has been developed as a function within Brisbane Airport's mobile application in conjunction with the Queensland University of Technology. It allows travellers to enter and save their personal information to the app before they arrive at the airport. 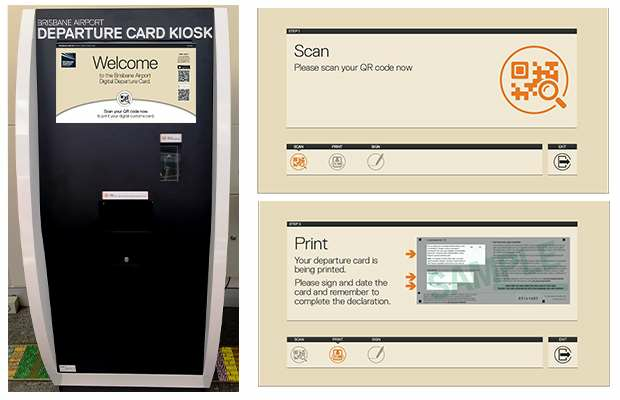 The data is converted into a QR code that is scanned and printed at dedicated kiosks within the airport's international terminal. Passengers can then sign the card and hand it to Customs officers as part of their departure. Frequent travellers can save their information within the application for future international travel from Brisbane Airport. The project arose when students within QUT's creative industries discipline were tasked with improving an element of the passenger experience. “Filling out arrival and departure cards stood out as being a process that some people struggled with, particularly those who didn’t speak or read English,” Professor Alexander Dreiling, chair of airport innovation at QUT said in a statement. “This ultimately involved students from the Business and Science and Engineering faculties coming on-board at both graduate and undergraduate levels to develop an electronic prototype which was presented to [Brisbane Airport]." The printing solution was created by Brisbane-based entrepreneur Stephan Clemens and his company Kernhard. Brisbane Airport said it hadn't been able to find an appropriate solution from mainstream suppliers. Should the trial prove successful, the digital departure card will be studied for performance measurement and refined for wider-scale release.